From uptown to downtown to out-of-town, Coach House Books can find their home anywhere. Explore the streets of the Fall/Winter 2019–20 Season That Never Sleeps with us! Explore the depths of our spring books! This spring at Coach House, we're going deep-sea diving for our eight titles to bring these gorgeous books to all our friends on land. The crew at Coach House Books knows how difficult it is to navigate the great big world of a brand-new season of titles. We might have coach in our name, but the books of Coach House are all first class: from the quality of their specially milled paper to the calibre of the words on their hand-bound pages. After over 50 years in the publishing biz, we aren’t just winging it; we’ve earned our wings. This spring, we're turning up the juice. The infamous Coach House presses are working overtime to produce the 100 percent pure, fresh literature you've come to expect from us. In these pages, you'll find the fruits of our labour, which we hope will appeal. Everything’s on the table with our Fall 2017 Catalogue. Our dusty old coach house doesn’t readily evoke bright lights and cold stainless steel. But spend some time watching Tony, our Coach House printer, square up a freshly printed press sheet, or take one look at our guillotine cutter, and you might begin to see a little of the surgical side that complements our love of the human and the messy. So, with a nod to the more exacting angels of our nature, this fall we’re putting everything on the table to see what’s inside. Get busy with our Spring 2017 catalogue! Seasonal allergies or not, at Coach House our noses are always twitching. Founded on a spirit of innovation that could never be mistaken for trend hopping, Coach House believes in literature that boldly examines the people, places, and traditions that comprise the everyday. Even if that calls for the occasional dive into the rabbit hole. Sink your teeth into our Fall 2016 catalogue! At Coach House, we like our books gutsy. While our little coach house may appear unassuming, we embrace a sense of boldness and adventure when it comes to literature, and we hope, dear reader, that you feel the same way. In that spirit, we’d like to welcome you to a season that’s definitely not for the faint of heart. Sink your teeth into our catalogue of Fall 2016 titles (illustrated by Kara Pyle). You're guaranteed to find something to chew on. Check out our Spring 2016 catalogue! This spring at Coach House, we're taking the plunge with eight aerodynamic titles that will leave you anything but spring-bored. Wade through the pages of our catalogue (with cover art by Hollie Chastain) and soak up spring at Coach House. The water's just fine. Celebrating fifty years of being good on paper! Now available: our new catalogue, featuring nine titles taking flight Spring 2015, and cover art by Fiona Smyth. Available online: the Spring 2014 Coach House catalogue, with cover art of the painting A Lady Sheep from the gracious and skilled artist Lindee Climo. Download the PDF and check out our upcoming Spring 2014 titles! Available online: the Fall 2013 Coach House catalogue, with cover art of a 'Space Hat Squirrel' from the talented Carollyne Yardley. Download the PDF and check out our upcoming Fall 2013 titles! 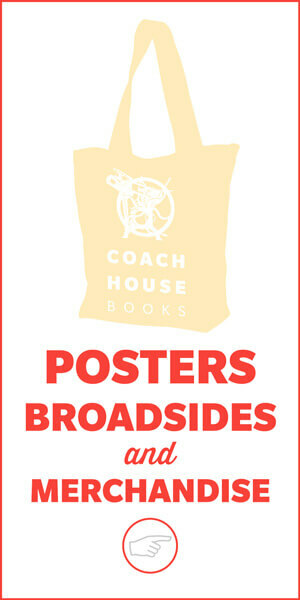 Available online: the Spring 2013 Coach House catalogue, with cover art of boxing horses from Dan Bob Thompson. Download the PDF and check out our upcoming Spring 2013 titles! Available online: the Fall 2012 Coach House catalogue, with cover art from Sylvain Cotte’s We Are All Animals. Download the PDF to read about our exciting fall titles! Available online: the Spring 2012 Coach House catalogue, with a new two-colour format. Download the PDF to read all about our forthcoming spring titles! Available online: the Fall 2011 Coach House catalogue, with an outstanding cover illustration by talented Canadian artist Ethan Rilly. Download the PDF (or view it online) to read all about our forthcoming fall titles! Available online: the Spring 2011 Coach House catalogue, with an outstanding cover photograph from Kevin Van Aelst. Download the PDF (or view it online) to read all about our forthcoming spring titles! Available online well before autumn: the Fall 2010 Coach House catalogue, with an outstanding cover image from Ryan Snook. Download the PDF to read more about our forthcoming fall books! Download the attached PDF to get a sneak preview of our Fall 2010 titles. Presenting the Spring 2010 Coach House catalogue, available for download. Presenting the Coach House Books Fall 2009 Catalogue.